I really enjoy using the Just "B" stamp set. There is the darling bee which you will see in the future to describe BIZESTAMPERS. There have been great bee stamps but this little whimsical guy, I can relate to. 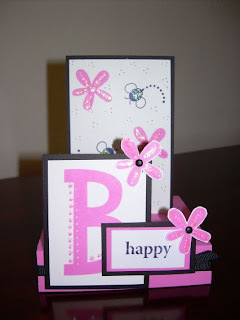 The 9 words in the set, HAPPY, CUZ, MINE, FABULOUS, is for Baby, is for birthday, just, WAY TO and yourself go perfectly for many cards. Check out the complete set of 12 on page 140.